The contemporary home, although chic and stylish in design also comes with a great deal of challenges, especially with regards to security and privacy. More and more people are thinking about all the possibilities when it comes to safety and being at risk for burglaries. This home however is more than just a structure, it is also a smart way to ensure the safety of the family and possessions within the house. The homeowners opted for a home with no windows facing the street and extra high secure walls surrounding the property, but what they got in return is a stylish and secure home that no one could have ever imagined! 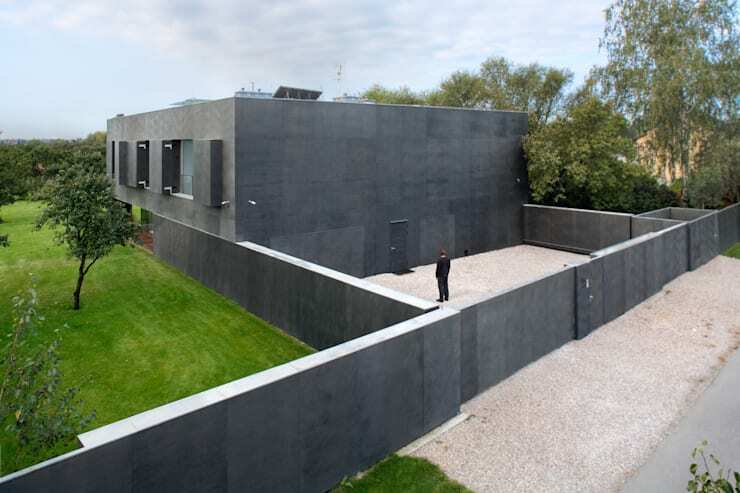 This home is closed and secure in safe mode, with windows of 2.8 metres in height and 3.5 metres in width as well as sliding walls enclosing and safeguarding the structure, the family and their possessions. 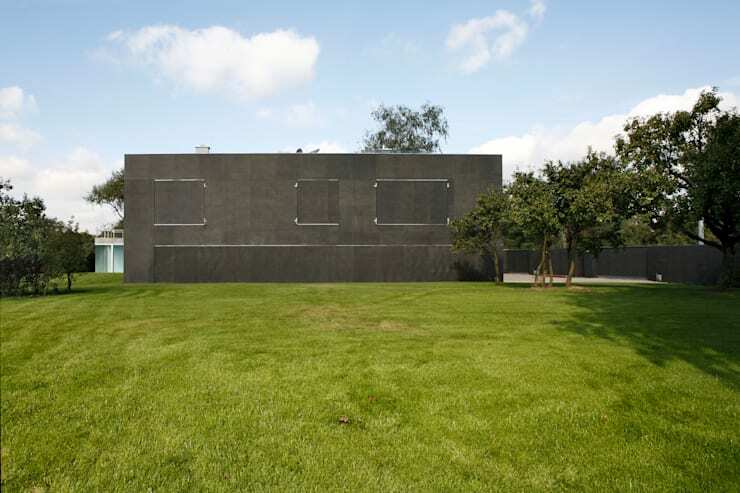 Although this home doesn't look like more than a concrete block at the moment, the industrial facade can be quickly converted to showcase the interior style of the home. An idea which the team of architects are really proud of! The home is now elegant, eye catching and filled with sunlight. The windows and doors are exposed to the exterior through moveable panels that slide open or are pulled out, allowing natural light to bathe the interior. It's clever, contemporary yet unusual in every way. From this close up view we catch a glimpse of the minimalist styled interior. When the shutters are open, this stunning ground floor living space is exposed to sunshine and gorgeous green lawns. The open plan living area consists of kitchen, living room and dining room and is comfortable, sleek and stylish. 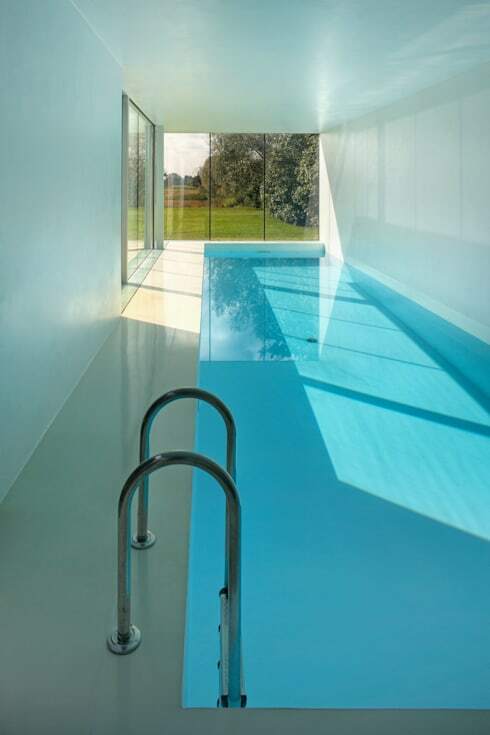 Keeping fit is important to this modern family and a lap pool was integrated into the home with this in mind. It is breathtaking, elegant as well as a soothing use of space, the brilliance of the room is accentuated by the all-white walls that are illuminated by the sunshine during the day. It's a great place to relax and unwind or do a few laps daily and train for a triathlon. 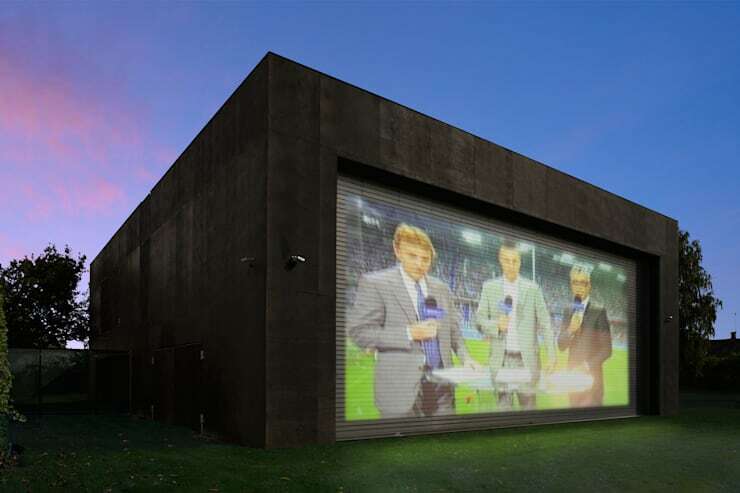 Everyone loves the idea of having a home that is stylish and attractive with eye-catching appeal that will leave your guests dumb struck and this outdoor projection screen is a great way to celebrate movie night on your lawn. The 14 metre roll down gate that closes the home's southern entrance is made from white anodized aluminium, which also makes for a fantastic projection screen. Invite your mates over and enjoy that rugby match on the lawn, which should keep all the noise outside. 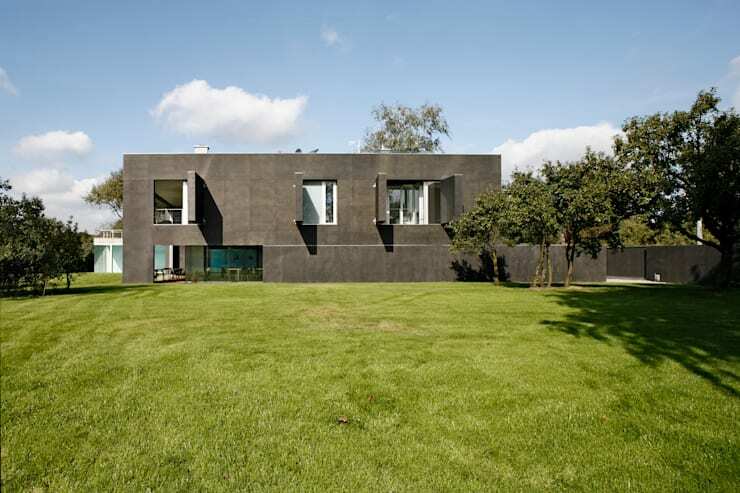 From this angle we catch a glimpse of the owner admiring the home from the courtyard of the compound, yet we can also enjoy the unusual and unique quality and integrity of this durable, different and dynamic modern home. It's aesthetically pleasing and eye-catching from all perspectives, while being a secure living space too. Careful and care free, this home doesn't worry about what other people think. A Beautiful But Humble Luxury Home is a great read too. Would you consider this as a safety option for your home?